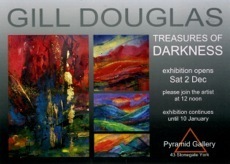 Strong dynamic paintings in various styles. From pure loose water-colour impressions to more figurative images with the addition of pen, ink and gouache, through to abstracts in mixed media and a small selection of oils and acrylics. 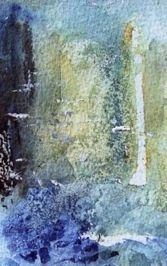 Subjects range from sea and landscapes, to interiors and abstracts. Though mostly painted in the studio from copious sketches made on field trips to the Scottish Highlands and Islands, Lindisfarne and North Yorkshire, the paintings are non the less evocative and have a great sense of 'place', reflecting the artist’s love of creation and The Creator. 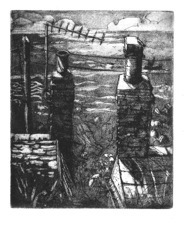 Here you will find a wide selection of original artists prints - etching in all its forms, collagraphs and lino prints. Traditional figurative images in black and white alongside colourful abstracts. Subjects here again are drawn from a love of the sea, mountains and islands. Atmospheric woodlands and wildlife also figure.